“Read my lips. No new taxes.” These are the words that enter the minds of most Americans when then think of President George H.W. Bush. It is an unfortunate turn of events that the President was placed in a position where a decision to raise taxes become a necessary compromise with Democrats. 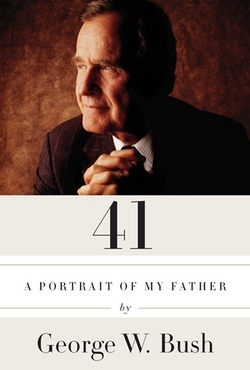 President George W. Bush writes about his father in the gripping biography, 41: A Portrait of My Father. The book represents the first attempt of son who served as president to write about his father who also served as president. The book spans the life of George H.W. Bush from his days growing up to his college years at Yale, his military service, numerous federal positions, not to mention his time in the oval office. Several reviews note sharp criticism for 41 but nothing could be further from the truth. Perhaps the most revealing insight into the life of the 41st president is his unfailing loyalty to country and comrades. George H.W. Bush was not a war monger as suggested by the liberal left. Rather, he was a political heavyweight. But more importantly he was a man of integrity and honor. He loved his country and is showed – it still does! President George H.W. Bush was not a perfect man. He made mistakes as we all do. But the 41st president of the United States made principled decisions; decisions that were informed by facts and inspired by honesty.